Spring is here and we’re swimming in repairs, but we’ve been able to keep the turnaround time to a minimum. We always have time for a same-day quick repair on simpler jobs to get you back on your bike. On bigger jobs like a tune-up or wheel rebuild, we’re never more than a week away from having your bike back to you. You can also schedule a drop off time if you can’t be without your bike for more than a day. Come by for a free assessment and we’ll figure out what you need and get you scheduled for a time. 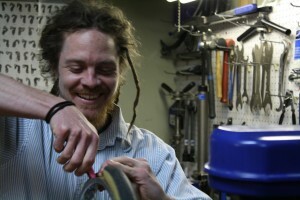 As always, airing your tires, lubing your chain, and assessing what repairs your bike needs are free services. If you’re not sure if you need a tune up or not, we’re happy to sort out what you need and go over it with you. This entry was posted in bike repair chicago, bike shop chicago, Commute, Commuter Bike, comrade cycles, Service and tagged bike repair schedule, bike shop 60622, bike shop chicago, bike tune up chicago, bike tune up shop chicago, commuter bike, comrade, comrade cycles, summer repair schedule by admin. Bookmark the permalink.